My husband mentioned cobbler for his birthday this year, so I strung him along and made him believe this was the only thing he was getting. I got up early, made a chocolate cheesecake while this was in the oven, and made some curry for lunch. We were both super pleased with this cobbler, I’d be willing to bet that you will be, too. Get a 9×13 baking dish and put 1 1/2 sticks of margarine in it. Place it in the oven until melted. Peel and slice the peaches. Place in a large pot on medium-high heat with the rest of the filling ingredients. Stir until combined and let the peaches simmer until a thick but still watery mixture forms. Around 20 minutes. Mix all of the crust ingredients together until a pancake like batter forms. 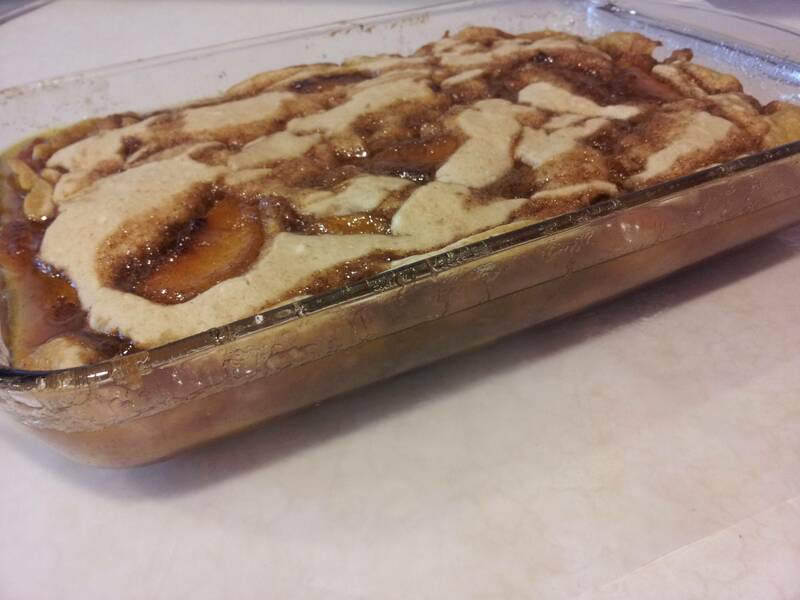 Place 1/2 cup of the peach mixture into the bottom of your baking dish along with the butter. Next pour a few streams of batter in over the peaches. Nothing is precise here, just keep layering the peaches and batter until you are done. Place in the oven at 350 and let cook for around 40 minutes or until crust is firm and the filling isn’t too watery. Keep in mind the filling will firm up once cooled.